Out of hundreds of deals that I’ve done, hundreds, on four occasions I’ve taken advantage of the laws of this country, like other people. I’m not going to name their names because I’m not going to embarrass, but virtually every person that you read about on the front page of the business sections, they’ve used the law. From this debate transcript discussed in this article. My question: is this accurate? Are four bankruptcies out of all his businesses a common or reasonable number of bankruptcy claims? Is this ratio consistent with other business entrepreneurs ratios? My focus is on the time period from 1965 to present. Beyond that I would prefer samples as similar to the sort of businesses that Donald Trump was involved in; however, I'm afraid that there is a limited number of entrepreneurs similar to Trump to compare to. I don't want to place too many restrictions and find that I've limited us to a sample size of one. Even a rough approximation would be better than no data at all, so a comparison with the average failure rate of businesses in America may be sufficient. Preamble - The Donald dodged the question. A "deal" does not equate to starting a business. But in the analysis below I'll err on the side of giving him the benefit of the doubt. If anyone has better data on bankrupcy rates in the US and the number of businesses The Donald owns I'd be interested in seeing them. 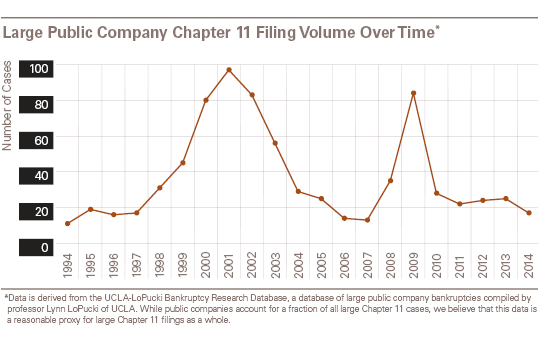 The Answer - Some data is presented here around the number of Chapter 11 bankrupcy filings in the US over time. In particular there is a nice graph given for Trump-ly sized public companies (assets > $280M) filing for bankrupcy that I've reproduced below. One can see that there is a baseline of ~20 Chapter 11 filings for these companies per year, peaking at ~100 filings at the front end of recessions (dot-com and the banking bubbles), averaging out at something like 40 per year (~800 filings over a 20 year period). According to US Census results from 2013, there were something like 5.7 million firms in the US. There are about 9,300 firms that could be considered Trump-ly (my arbitrary definition being a company of 1000+ employees). Assuming this is representative of the number of Trump-ly firms that existed each year since 1994, we have a Chapter 11 filing rate of 40/9,300 = ~0.4% per year. The Donald cited over 500 businesses he is an executive with as part of his candidacy filings. Let's use this as an assumption of the average number of businesses that he has started that exist at any one time. At 500 businesses per year, a failure rate of 0.4% per year means that you could expect two (2) of his businesses to file for Chapter 11. So based on these assumptions he is batting well above the average. Not the answer you're looking for? Browse other questions tagged politics economics donald-trump .